Back in December the spot previously occupied by Badass Jack's in the university area got new signage promising hot dogs and deep fried chicken. With hopes for a new Korean fried chicken (KFC) place, I eagerly awaited their opening. Edmonton's solution to the lack of Asian-inspired hot dogs has finally arrived, and they're serving up some crispy deep fried chicken too! IT' DOG opened up this past Tuesday and every time I've driven by, the little fast-food spot has been fairly busy. 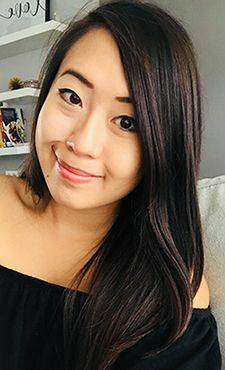 I stopped by on Wednesday evening for a quick bite and was greeted by a friendly cashier, the sizzling sounds from the deep fryer, and the cooks chatting to one another in Korean. The restaurant is small, accommodating 15 at most, but sitting down for a meal is quick, and many orders are taken to go. 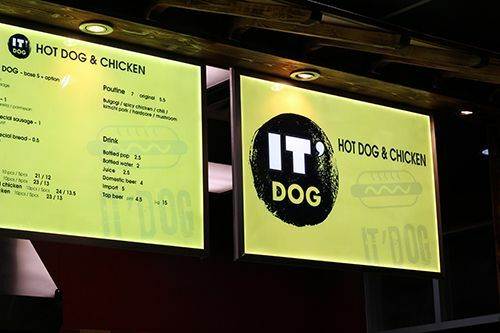 The menu is easy to read and split into four different sections: hot dogs, chicken, poutine and drinks. The hot dogs here are 100% beef, and there are 11 different variations of a Korean-style hot dog served on a pretzel bun. If you're not the adventurous type, they offer a plain hot dog too. 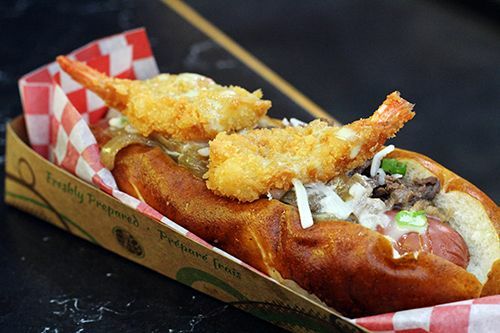 I chose to try the IT' hot dog ($10), where the grilled beef sausage was topped with bulgogi, tempura shrimp, mushrooms, caramelized onions, green onion, mozzarella and sweet wasabi mayo. The toppings were generous, as each bite allowed me to taste a bit of everything. I found that most of the toppings gave off sweet flavours (bulgogi, onions, mayo), while the saltiness came from the hot dog itself. Every topping had a different texture to it and I actually quite enjoyed the combination. The pretzel bun was soft and warm which, combined with the abundance of ingredients, made the hot dog very filling. 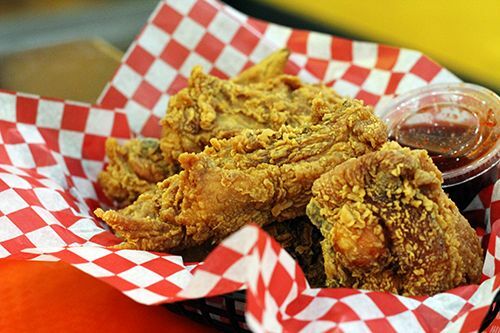 The chicken menu has four choices: plain fried chicken, sweet and spicy, sweet mustard or soy garlic in 5 or 10 piece sizes. We ordered 5 pieces of the Sweet & Spicy Chicken ($13) with the sauce on the side to avoid having to eat soggy chicken, and the kitchen had no problem with the request. The chicken came out piping hot (seriously, I just about burned myself! ), and the golden skin looked promising. The KFC here is the real deal! Biting through the thin, crispy skin revealed tender and moist chicken beneath. The chicken by itself was seasoned well enough for my liking, but the sweet and spicy was a great addition too. The sauce isn't overly thick and is more sweet than spicy. I would have enjoyed more heat from the sauce, but overall IT' DOG has some pretty delicious KFC. If you've got a hankering for some fun Korean style hot dogs or some juicy deep fried chicken, get yourself to IT' DOG soon! They're open at 11:00 AM daily and are available late night Sunday - Thursday until 12:00 AM, and until 3:00 AM on Fridays and Saturdays. Order a nice cold beer to go with your chicken, or order some chicken to sober up, depending on the time that you visit. Full menu & details available on their Facebook page.